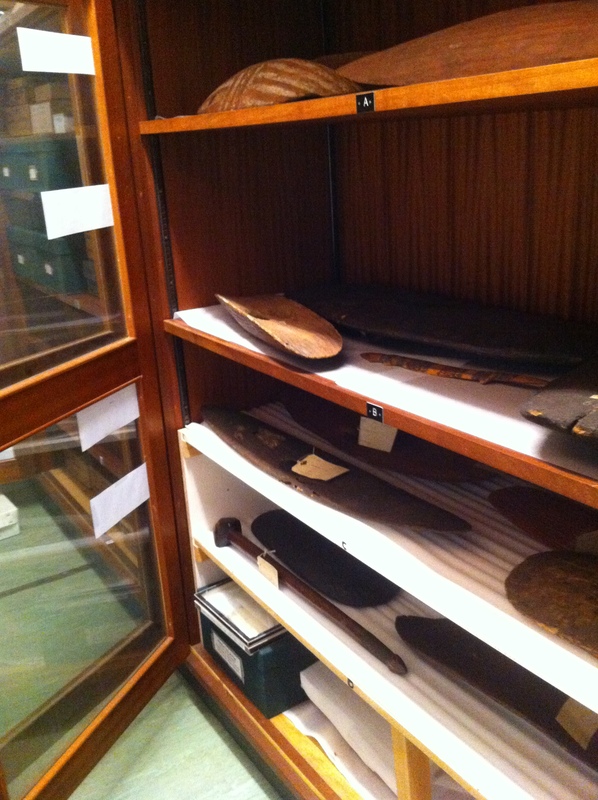 Since I joined the Manchester Museum at the end of April 2014, I have been working on the important collection of material from the Pacific, with the aim of improving our collections documentation and the storage conditions for our objects. Systematically working through the stored collections, I have been making sure that objects have correct locations recorded on our database – a crucial piece of data for good collections management. I have also been photographing objects to add images to the database, which is helpful is allowing us to quickly identify a particular object when we receive enquiries from colleagues, researchers and members of the public. Indigenous Australian objects in our store. This approach to reviewing the collection has brought to light a number of issues; how should we look after objects which are secret or sacred in their originating communities? How do we deal with historical terms which have been used to describe objects in the past, but which would be culturally inappropriate or easily misunderstood today? These issues are particularly relevant to an ethnographic collection amassed from cultures which have changed in the post-colonial period, adopting different names for indigenous groups and for their countries as they gain independence or greater recognition. 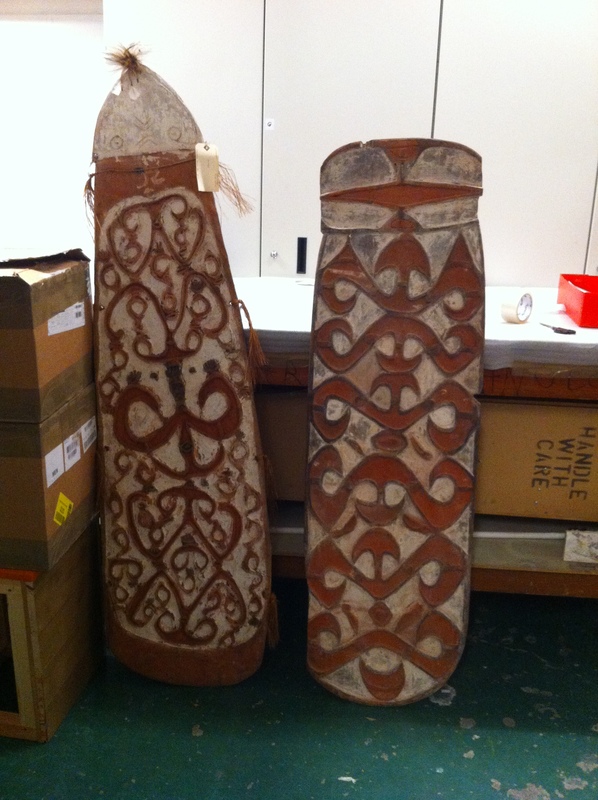 Two large shields from the Asmat region of West Papua. Large objects like these are challenging to store, especially when they include materials like feathers which are particularly sensitive to insect damage and storage conditions. 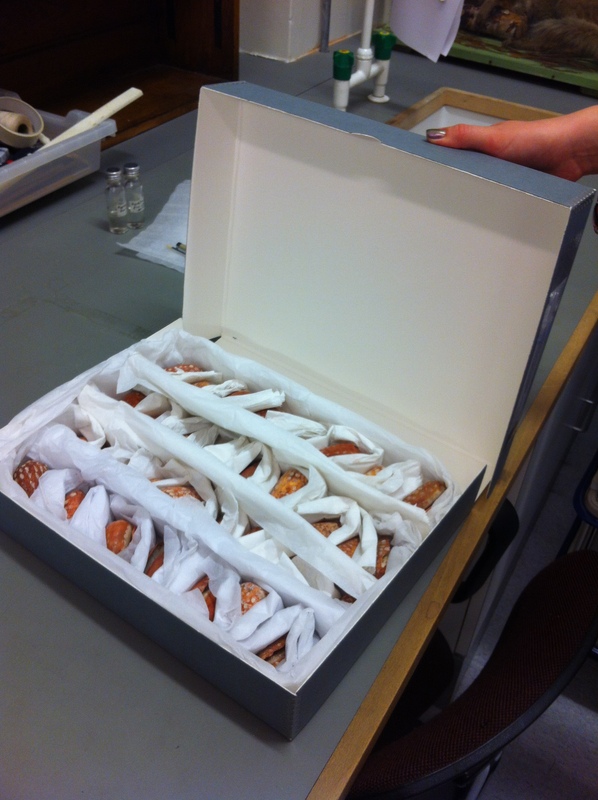 A further issue to contend with in the museum is how to store our collection most efficiently. Many of our stores are now full, and cannot take further material. However Manchester Museum is currently developing its approach to collecting, with the aim of continuing to develop the collections with contemporary material. As I continue through my placement with the Living Cultures collection, I need to think about how our storage space could be used more effectively to incorporate future acquisitions alongside the valued historical material. Working through the collection has allowed me to identify areas where storage can immediately be improved – these Indigenous Australian dolls have been repacked into new acid-free boxes with the help of our volunteer Eleanor Myers. While under-taking this ‘behind the scenes’ collections management work, I’m also becoming involved with the public programme at the museum. Using the Pacific collection as inspiration, I’m currently developing a ‘Big Saturday’ event for the 27th September 2014, which will allow visitors to engage with the cultures and environments of the Pacific through a wide range of activities. I’m also hoping to assist in delivering further events over the next nine months to broaden awareness of the fascinating Living Cultures collection and its relevance to contemporary issues. This entry was posted in Events, Recent developments, Research and tagged Anthropology, Collections, Ethnography, Living cultures, Manchester, Manchester Museum, Oceania, Pacific by kieragould. Bookmark the permalink.